NES Where's Waldo? (USA) in 02:05.83 by MESHUGGAH. Where's Waldo? is a video game adaptation of the classic puzzle book series of the same name. 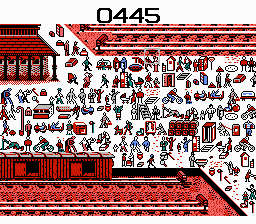 The player needs to identify crude, pixelated versions of Waldo amidst enormous crowds, guess blindly where he is in a cave, collect items on a subway track, and finally send him to the moon where he can no longer hide in crowds. In this movie, MESHUGGAH improves the previous run by 6.68 seconds through better luck manipulation.